Everything about the Titanic was special and expensive in the day. Their deck chairs were no exception. They were custom designed for the great ship and are a popular wood craftsman build to this day. Plans for making your own full-size version can be found The Wood Archivist website. A gentleman was looking at my cardstock models a while back and told me he was working on a 1/48th scale diorama of a section of the Titanic’s deck. He had been unable to find similar lounge chairs. After some discussion and staring at the plans, I decide to tackle the problem with card stock. Here is the final result. 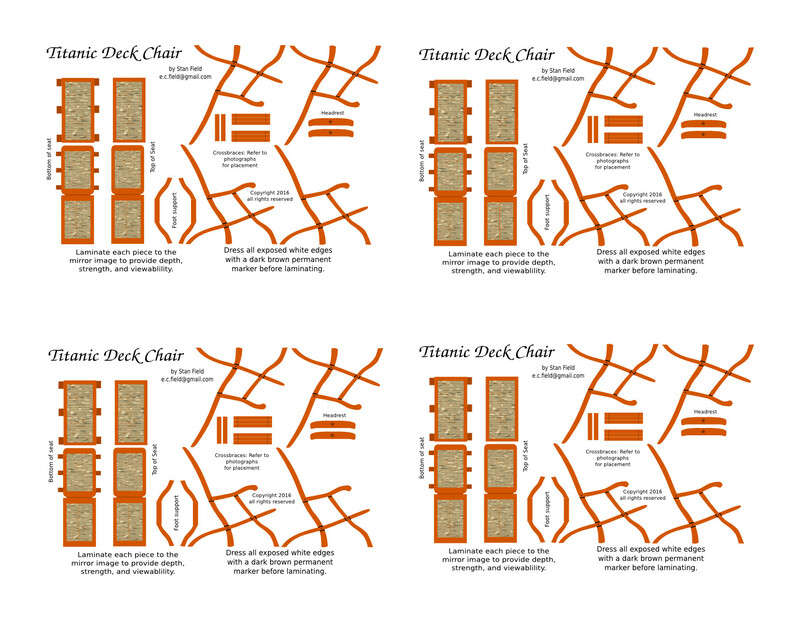 Anyone who wishes to update their O-scale scene is welcome to click on the image below, download the four chair kit, and print their own. If you print it on postcard stock, each chair fits on a standard postcard. This can be useful for a model RR club who wishes to put their own advertisement on the back and hand out. If you find it interesting, then drop me a line and a photo of it in your scene. Fair warning: This is very tiny and fragile. While I attempted to remain true to the original, this requires careful cutting and handling. Here are some build pix.